Enter a world of wacky inventors, crazy contraptions, and gold – lots of gold. 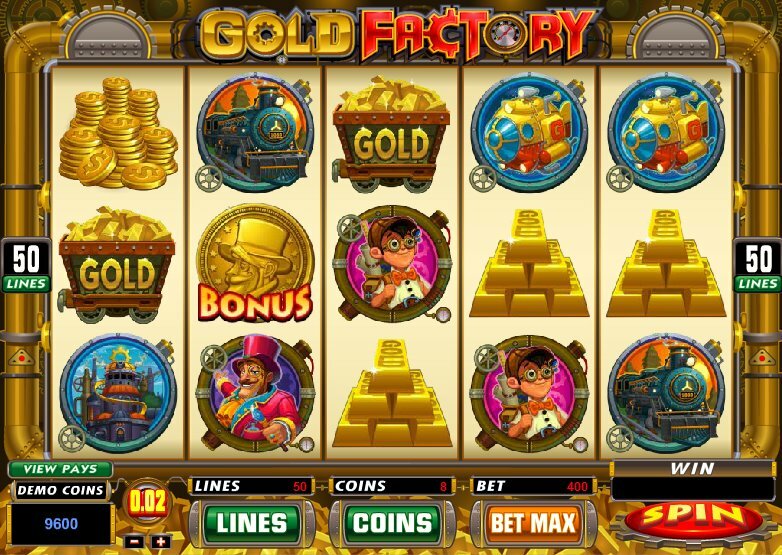 Online casino software developer Microgaming have gone all Willy Wonka – or should that be Willy Wonga – with Gold Factory. And fans of Playtech’s money-themed slot, Mr. Cash Back, will lap this 5 reel, 50 pay-line slot up. If Roald Dahl was a bit more on the materialistic side, he might have come up with something like this – a mad inventor who sends underwater submersibles on a hunt for treasure and gold coins – lots of coins - with his trusty assistant in tow: it’s the backdrop for a typically out-there offering from the pioneering slots developers. The wacky music that persists throughout the game sets the tone immediately; all we need is some gold-plated Oompa-Loompas to jump out and sing their way through the bonus round. There are bright graphics and some sweet animation, and the gold colour scheme is like an assault on the senses. Plus we have factories, airships and those submarines, plus the requisite piles of gold bars. So, will you be as rich as the inventor in this story? There’s every chance, as the jackpot is a staggering 619,000 coins in this game. The Gold Factory symbol acts as the Wild and substitutes all other symbols other than the gold coin scatter. Five Wilds bags you a jackpot of 7,500 coins. However, it’s this gold coin that you should be concentrating on, as getting three or more of those nuggets anywhere on the five reels will trigger the Boiler Room game. The Boiler Room feature presents you with 12 carts laden with gold. Each bears coins or one of two additional bonus tokens. Your job is to find the gold and those bonus tokens. You have four picks in the initial game. Is that all? Not a bit of it. Find the free spins or the Reactor bonus tokens and you will be taken to another bonus game. In the free spins bonus feature you will have the chance to win between 10 and 35 free spins. All free spins pay double and cannot be re-triggered. In the Reactor bonus it’s another selection process as you’re presented with 12 smelts from the mad inventor’s reactor. Simply carry on picking until you find a malfunction in the machine. Each successful pick will award you a prize, and for each selection you didn’t win you will be awarded a consolation prize. I’ve mentioned online slot developer Playtech’s Mr. Cash Back, and that innovative slot is certainly worth your attention, but the bonuses and jackpots of Gold Factory mean this is where your moolah should be concentrated. And while we’re on the subject of moolah, don’t forget to check out Microgaming’s safari-themed slot, Mega Moolah, for more chances to win big jackpots.